This is the latest serialized chapter in the book I am working on. If this is your first time reading "The Very Last Summer Vacation Ever," please go back and start with the Prologue. As the sun began to set on our first full day on the road, a quiet descended. The Old Man drove on, humming to himself now and then, and the back of our mother's head bobbled stiffly on her thin neck, betraying nothing, playing it's cards close. Mallory and her walkman were slumped deep into secret inscrutable alien girl thoughts and Great Aunt Ginny was sawing wood, her ancient head thrown back emitting quiet grunts and whistles, her lizard neck inflating and deflating gently with each labored breath. I turned my gaze up to Alex the eldest, crammed in beside me, squooshed uncomplaining against the driver's side passenger door. His thin face tried gamely to resemble our fathers and in the flattering amber light it almost did, it would have if not for the fine film of signature irritation, so classically his own. I could see he was pondering and I thought this lull in the family conversation, this pause with twenty questions all played out and license plate bingo not yet asked for, might be one of those rare occasions when my older brother might speak earnestly to me of things I yearned to know, and set aside for awhile the traditional brotherly bickering and name calling, the ritual assignation of blame. "Well, now, y'see, Squirt, this is the thing..." He began, and I knew what followed would be important, for each word of that sentence was a note, he was almost singing to me with the 'Well' being a high pitched falsetto and the 'now' just a bit lower and the 'y'see' descending a minor third and the 'squirt' being right in the middle of his range and the 'this is the thing' coming out low and rich and all quarter notes. "I have always seen life as an endless series of minor hassles punctuated by tragedy. You cut yourself shaving, unexpected traffic makes you ten minutes late for Macroeconomics, the yogurt you brought for lunch is two days expired, and it goes on like this for weeks at a time until someone tells you a beloved uncle you thought you'd see come Christmas has died of cancer instead. But I had an answer to all of that, or thought I did. A career in Public Policy. I would make of myself a perfectly balanced cog in the classical Confucian manner. Not a straw man, a soulless ferret, veins flowing with red tape where blood should flow, an image so often and easily foisted upon us by the vast cretinous hive minds of the media, but something beautiful and true, a bureaucrat who worshipped at the throne of perfectly functioning order. So in some minor way I dreamt of swimming against the tide, advocating and assisting the statistically unlikely humans that came into my path and doing it well enough to alleviate a portion of their unavoidable suffering. But now none of that will ever be. The teetering, massive ramshackle, ornate pseudo organic mechanisms that run our society have finally grown so baroque they must extinct themselves. Like that species of ice age venison whose magnificent antlers evolved ever more elegant and complicated shapes to impress their womenfolk until eventually the poor bastards could not lift their heads, or became hopelessly entangled in the underbrush or the antlers of their peers and so were doomed to die a death of slow starvation as the 'selected against', Our systems of governance have begun to inexorably collapse upon themselves. It was bound to happen, but like my forefathers, I prayed it would happen to my children. Unfortunately, their prayers, not mine, were heard. What I shall do now and what will become of me I do not know." I wanted to offer him something in return for this confidence, some nugget of my own wisdom that might buoy him up, but I had none, and we both knew it. Also I was jealous. For in his anguish he at least had something he was loosing to hold up in the face of the end of it all and the fact was I had squat. No particular dreams to nobly hold onto or jettison as they got squashed, no goals, no ambitions, not one plan. Here I was hurtling toward oblivion, and I had not one shred of character or experience to shed along the way, and that was a fact that stung. I was callow, and in the darkening silence I chewed on that. "AHA!" Our Old Man bellowed, "I spy with my little eye a hotel! Lets see if they have a pool fit for the Gallaghers!" They did and we lounged around it like Romans, Even Great Aunt Ginny miraculously packaged in a glistening one piece spandex sheath, her portable oxygen compressor happily wheezing beside her chaise lounge, even our Frodo, ecstatic to be at last set loose to loll upon the concrete, exposing her belly to the moon. 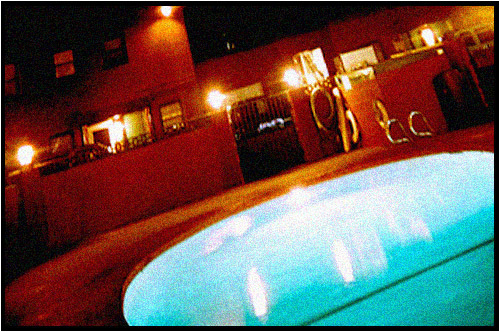 We had the pool mostly to ourselves, sharing only the shallow end with a family of three, quiet and shrouded in darkness. Crickets and peepers sang in the night and the chlorine scented, heavy, humid air pressed on our wet bodies and Mallory frisked like a mermaid under the diving board, briefly at peace because under the water she couldn't hear us, and she could hold her breath for a very long time. Fireflies sparked here and there and our Alex remarked upon how their bioluminescence radiated no heat at all, a mystery of science. We Gallaghers relaxed and all was well with us until the front desk girl came by to tell us the pool closed at ten o'clock, which was the time it was. "Tell me your name, front desk girl," our old man said unpacking his charm, and she allowed it was Taniqua. "Taniqua. Tah-nee-kwah. Tah-nee-kwaaaaaaaa," he said, his head dangling backwards over the back of his pool chair, "Now that... is a name of African royalty. That's no name for a front desk girl. That's no name for a ten o'clock pool closer. Taniqua, that's the name of a fiercely individual woman who laughs at pool closing times. That's the name of a woman who knows that setting a time a pool closes is a crime against nature! Do you watch the news ever, Taniqua?" she allowed she did. "And the Internet? Do you peruse it now and then? What do you see? Celebrity Girls just half your age having babies and letting them sit unbuckled in the front seat. Typhoons sweeping third world hamlets and vast coastal cities into the sea without prejudice or discrimination, the dogs of war unleashed, well known television men of the cloth attempting to pass drug tests by means of a prosthetic wanger. The center will not hold, Taniqua. All the old laws are tumbling down, the end times are upon us and the rule of law is strained to breaking every which way. Maybe yesterday this pool closed at Ten o'clock, but yesterday is as dead and buried as our Great Aunt Ginny ought to be. The closing of hotel pools is all over and done with now forever and ever, don't you see, Taniqua, and there is no use in clinging to it! Free yourself, shake off the chains of pool closing, look, look into the abyss and know that you have always been free if only you had known it, which now you do! Sit a while with us, Taniqua, take off your shoes and dangle your tired feet in the waters! Don't you want to watch the fireflies?" Taniqua allowed as to how maybe she did. On the other side of the pool near the shallow end the other family switched on a little portable lantern. It picked them out of the growing darkness and when I looked at their light the dark around them seemed darker and they looked like they were a TV show. The Dad was a lanky pale guy, younger than my Old Man. The Mom was kind of lumpy, like a Jell-O salad that got poured into a human shaped swimsuit. Their kid was a girl about my age. She was splashing around down there in the shallow end, holding this ball under the water and then letting it explode up to the surface. She did it again and again, and I got to thinking, why is she doing that? I mean once or twice, okay, but just how entertaining can it be? And then I got that she was just doing it. She's here at the pool with her parents, she's in the water, and it's just something to do, like cracking your knuckles or picking at a scab. Then she hauls herself up and sits on the edge of the pool. I like her hair. It's long and straight and dark, which is really all it could be since it's wet. It could be blond, or red, curly when it was dry, or any way I imagined it to be. I imagined I got up and walked around the pool until I was pretty close. And she said 'what's your name?' and I said 'Jimbo'. And I said 'you here with your folks?' and she says 'Yeah.' And I say, 'there's this mini golf place right over the other side of the parking lot, do you want to go?' and she says 'ok'. So we go and I pay for us to get clubs and balls. She takes a yellow one. 'You don't want pink?' I ask, and she says 'Screw that' and throws the ball up in the air and catches it, and I think she might smile at me then, but she doesn't. I take a purple ball. We play mini golf. There's bugs that fly around the lights, but it's not too bad. There's almost nobody here, so we don't have to wait hardly at all between holes. At this one hole there's a Popeye the Sailor Man with a can of spinach in his hand. You have to shoot the ball between his legs. It's not hard. 'That's not much of an obstacle' I say and she says 'I think he's just for atmosphere.' There's the obligatory windmill hole. She gets right through, but I keep hitting the blades. 'You only get five strokes' she says. 'It has to be that way or we'll be here all night.' and I think that would be OK but don't say anything. The last hole is the Statue of Liberty. She's buried up to her chest in the sand. You have to hit the ball so it rolls up her arm to the torch and then into the cup. 'If you get a hole in one, they give you an ice cream for free' she says, but it's clearly impossible. 'I don't care how many shots they give me, you can't make a golf ball do that.' Then she does smile at me. Because of course that's the point. They don't want you to get the free Ice cream. What the hell kind of business would they be in if they gave away ice cream for free? The girl and her parents are gone. My family is gone. Taniqua is gone. I'm all alone at the pool and I don't know how long it's been that way. I get up, walk back to the hotel, up the outside steps to the second floor, still wet and just as cold as bejesus. The door to my parent's room is open. The TV is on. The Radio is on. Mallory has found a hair dryer attached to the wall and she's turning it on and off, on and off. Great Aunt Ginny is up one bed with Frodo. The old Man and my Mother and Alex and Taniqua are clustered around the overturned mini bar, gorging themselves on mineral water, smoked almonds, Toblerone bars. My Father brandishes a wine cooler. "WE..." he bellows, "WILL NEVER... PAY... FOR ANY OF THIS!" SHARE YOUR THOUGHTS IN THE READER COMMENTS SECTION BELOW! We'll leave the light on fer ya. Until I read 'Internet' I thought the story was in a different time setting, like in the 70's. Love your narrative, Max. Waiting for the next part. Thank you for writing more stuff, funnyman. I had to go back and read it twice to understand the miniature golf part was a daydream. Please crank out more funny words for our amusement. Chapter 4 when? Damn good read!